Our team of instructors comprises of expert traders who are committed towards the professional success of each learner. They ensure personal attention to the learner’s trading problems and concept clarification. It is the collaborative effort of our professional trainers backed by decades of experience of Sharegurukul, which makes it an amazing learning experience. Mr. Ashok Jain has a trading experience of over 40+ years, using technical trends. He is one of the premier faculties of Technical Analysis in Delhi. At Sharegurukul, lot of students not only have gained technical analysis knowledge but have made huge profits from stock markets and made great careers in the field of Technical Analysis. 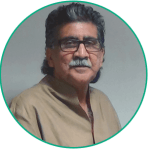 He has set and developed trading desk for various financial institutions on Technical Analysis, Portfolio Management and derivatives which have greatly enriched his teaching skills and have made him an outstanding instructor. He is a self -taught market timing professional who teaches a unique combination of trading tools for trending & non trending markets to achieve consistent gains on stocks, commodities and options. Apart from teaching and personal trading, he is currently managing large amount of funds on client’s He is a B.E in Mechanical Engineering and the fact is that the well renowned technical system traders such as Wells Wilder and John Ehlers are Engineers by profession. 15 years experience as a trader and investor and has a knack for technical indicators. His simple approach helps the students in learning the nitty gritties of market. Often referred to as the man with golden fingers. He specializes in arbitrage and is responsible for creating huge teams and innovating multi facet arbitrage opportunities in the market for the last 10 years. He specializes in identifying deep value companies with a solid margin of safety, income investment with strong potential for capital gains. He will teach you the same time-tested principles of risk and money management that have long been employed by most seasoned professionals.